I awoke this morning to a text from my neighbor saying she could see the fires in neighboring Santa Rosa from her porch. By the time I got up and looked at the news, 1,500+ buildings had burned to the ground including the Luther Burbank Center and Fountaingrove Inn, both places I had frequented for entertainment and workshops. Kaiser Hospital where I used to go for doctor’s visits was completely evacuated. 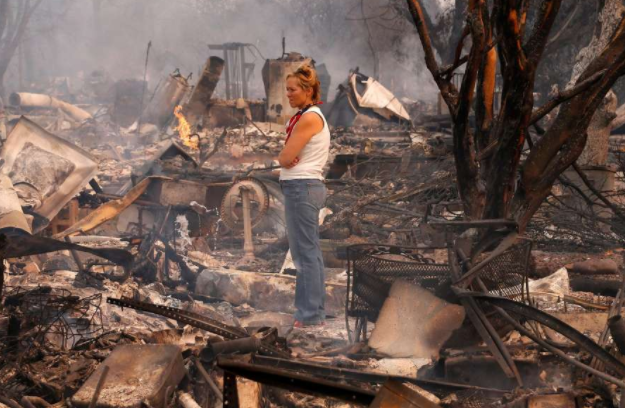 Fires were exacerbated by 50mph winds and record low humidity. Friends at a retreat I almost went to were evacuated from their Calistoga retreat center at 12 midnight, just 10 minutes before it burned to the ground. One friend lost her harp and laptop but escaped with her mom to safety. All day we watched the news, fearing that the fires might turn our way. We saw one person after another speaking of the unbelievable loss… homes completely gone with nothing but a metal wind vane or a brick chimney to mark the spot where they’d raised their kids. Ash fell on our property all day long. As I looked at misshapen bits of debris, I wondered, was this part of someone’s house? It was impossible not to cry, thinking of all those suffering because of this. In fear but mostly just to keep busy, I started packing a bag. I looked around at all the stuff in my home office and my clothing closet. And mind you, there’s a lot of clutter, just too much stuff. And to be honest, I couldn’t really find much of true value, nothing that I would be devastated about losing. Of course I wouldn’t want to lose it, and I love my home and want it to be safe. But most of the stuff is just stuff. That really got me thinking. Why do I have all this stuff? What does it really matter? Why did I spend my money on it? Why do I keep it around? I think about all the hours I worked to get this stuff, times I stressed over money so I could keep all this stuff. It’s like an American illness: consumerism. And I caught it. So as people set off for a night of only light sleeping, if any at all, I am going into a meditation of prayer, for all those who lost so much, and all who are still in harm’s way. And also for myself to transcend this consumerism and get more real about what’s important and what isn’t. When the smoke clears, I’ll be taking a good long look at everything I have and making an effort to give most of it away. Many folks will have lost all their clothing. I can give most of mine to them. We have extra furniture. I’ll give folks who have lost everything our extras. We have books coming out of our ears. Those can be donated to charity, where someone might actually read them. The extra china, glasses and knick knacks in the basement might be enjoyed by someone else. And when it comes time to buy something new, I’ll try to remember this day and ask, if there were a fire, would I want to bring this with me? And if not, do I really need it now? I fear I will forget. So I’m posting this on my blog and I’ll do my best to stay mindful. We Americans so easily forget reality. I want to be one who remembers. I reread this post Julia and I really enjoy the thoughts about “just stuff”and sharing what we have with others less fortunate. Thanks for sharing your thoughts and gifts!.